Vision development in babies is an amazing process, beginning long before birth. 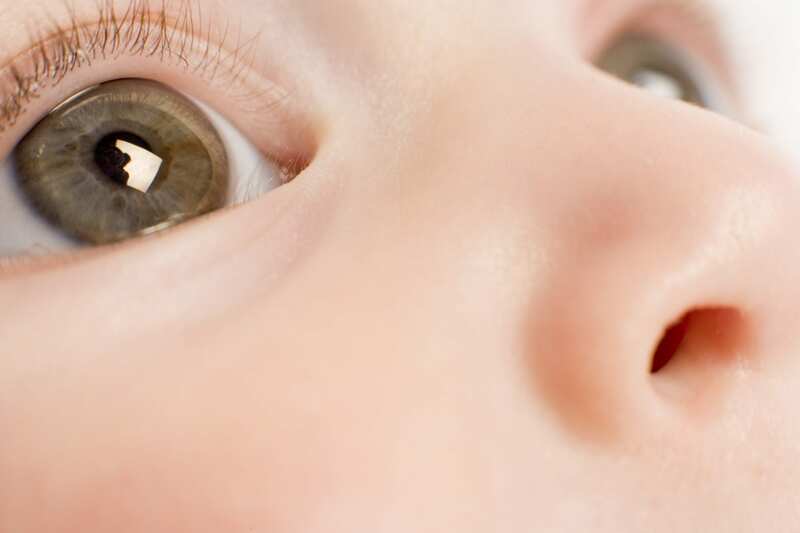 A baby’s eyes begin to develop before many women even discover they’re pregnant. By six weeks (or less), the eyes have begun to form. Eyelids are formed between 10-12 weeks. During weeks 16-17, a baby is able to see light even though their eyelids are still closed. In fact, a study has found that the eyes of unborn babies, especially the retinas, need exposure to light in order to develop as they should. During the seventh month of the pregnancy, the baby’s eyelids are able to open and close. Newborns are able to see light and movement. However, as their parents may have noticed, the eyes of very young babies can’t yet focus or follow movements. Your baby is born with the complete “system” needed for vision, their eyes, but needs to learn how to see. Before your baby is two months old, he can’t focus very well on anything. By the time a baby is two or three months old, she has learned to focus accurately. Babies love to look at their parent’s faces, during feedings or play time. Many parents hang mobiles over their baby’s crib to give them something fun to look at. The muscles of the eye need time to develop. The eye needs to learn not to focus “too close” or “too far away” when looking at either close or far objects. If you hold a stuffed toy in front of the baby and move it slowly, the baby will follow the moving toy with jerky movements of the eye. By the time your baby is three months old, you’ll notice his eyes can track and follow an object moving slowly. She can now follow the moving toy smoothly with her eyes. By the time a baby is four months old, he should be able to track a moving object with his eyes and reach for it. Depth perception is very important for proper vision throughout our lives. It’s the ability to judge whether an object is closer to you or farther away than other objects. It’s a critical skill for driving, sports, and many other daily activities. When a baby is born, she has no depth perception. This ability is developed when he is three to five months old. At this age, the eyes are able to work together, necessary for depth perception. Without depth perception, everything would appear flat or two-dimensional. We live in a three-dimensional world. Baby’s begin to see in color at a very early age although their ability to see color is not nearly as developed as an adult’s. During the first month or two after birth, a baby is able to see two highly contrasting colors, like black and white. As you can imagine, it’s hard to tell exactly when an infant can tell the difference between blue and green, for example. Their eyes might simply be attracted to an object’s brightness or to an object that contrasts sharply with the background, such as a red toy against a white wall. Facial recognition begins very early, as any parent knows. When a child is born, he is able to see facial features, although a newborn may seem to be staring at your hair or the side of your face. Within the next 8-12 weeks, she will begin to pay a lot of attention to various features, such as the mouth or nose. By the time your baby is three to five months old, he should know the difference between your face and a stranger’s face. Your baby’s vision will continue to develop as she grows older. Finding any developing eye problems early is very important for everyone, but it’s critical for a very young child. Pediatricians typically perform vision screening during well-baby visits. Many schools also screen for vision problems. While these screenings detect many problems, they aren’t the same as a thorough eye examination at Florida Eye. The team at Florida Eye Specialists and Cataract Institute is dedicated to caring for the eyes of both children and adults. For more information about vision development or to schedule an appointment with an experienced physician, contact Florida Eye at 813-681-1122.